Organic Rankine Cycle has proven to be ideally suited to exhaust heat recovery from both engines and gas turbines in low-medium size range. 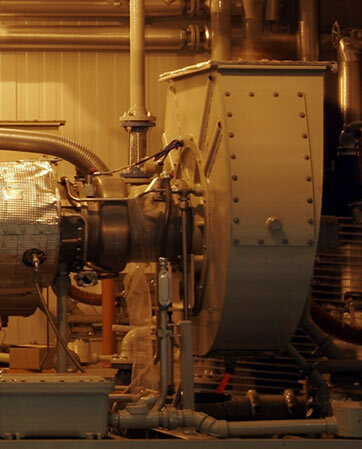 Recovering exhaust heat from gas turbines and internal combustion engines is an easy way to optimise efficiency and performance whilst at the same time reducing the environmental impact of power generation plants widely employed for processing and refining in Oil & Gas sector and in the electricity production field. 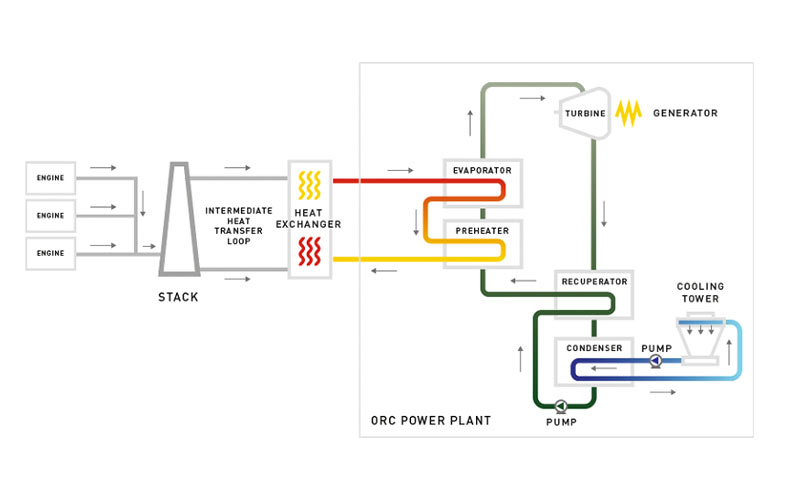 When it comes to available technologies to recover waste heat from these sources the market offers two commercial solutions: steam technologies and Organic Rankine Cycle systems. WHR plants employing steam offer advantages in both efficiency and security for plant operation but they lack flexibility and require more maintenance when compared to ORC. 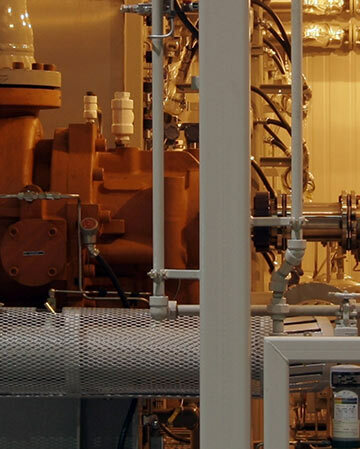 Organic Rankine Cycle (ORC) has proven to be ideally suited to exhaust heat recovery from both engines and gas turbines in low-medium size range. This application counts nowadays the 65% of the total ORC power plants installed or under construction worldwide (2017 figures). EXERGY’s ORC single units power size range between 1 MW to 20 MWe. 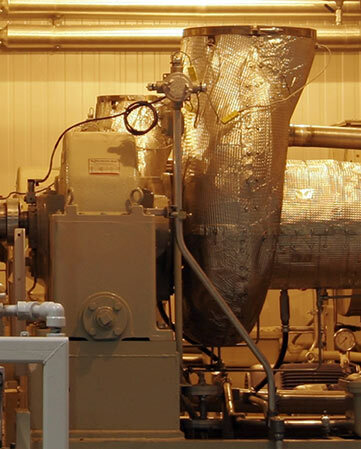 The heat recovery system extracts the thermal power from the exhaust of the engines or turbines to feed the ORC module via an intermediate loop of heat recovery. The intermediate fluid, which is usually oil, transfers heat to the organic fluid in the ORC evaporator, where the organic fluid vaporizes. 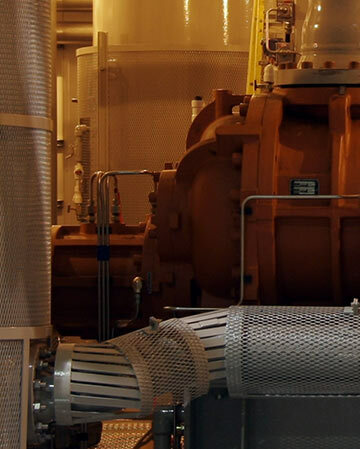 The vaporized fluid then flows to the turbine. Here the vapour expands causing the turbine to spin and creating electricity in the generator. 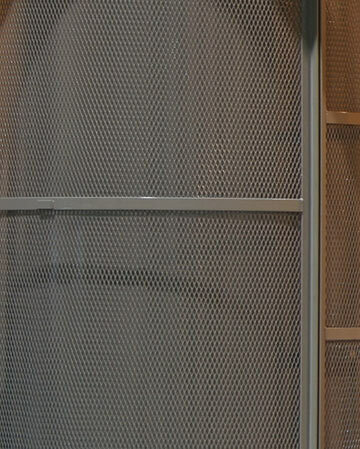 The vaporized organic fluid then continues through the cycle to the condenser where it transforms into liquid, ready to be processed by the pump before beginning the cycle again. the use of flammable fluids at the interface with the hot flue gas which instead is not necessary with steam technology. 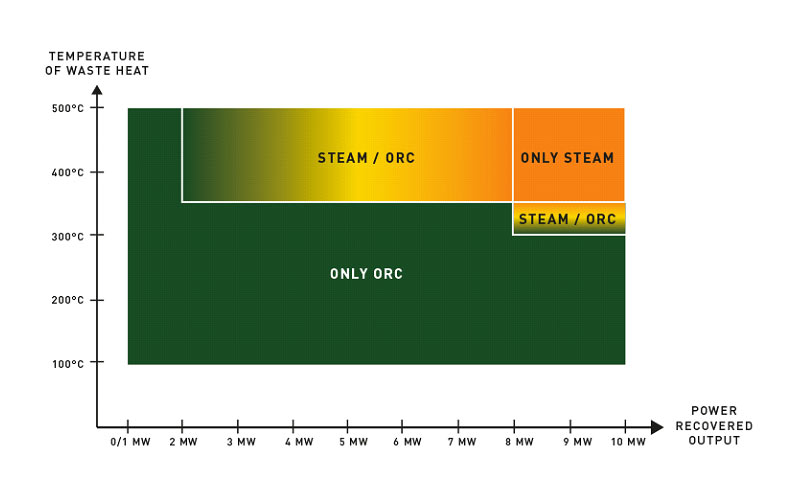 EXERGY’s R&D activities on WHR systems are today focusing to give an answer to this gap with an innovative ORC configuration (patent pending) combining the benefits of steam technology and ORC technology.